I found a couple of small potatoes in my potato bin that had sprouted a bit. I considered putting them in the edge of the woods for the critters. Since there were only 2, I decided to try something that I wanted to try for years; growing potato plants in a bucket. According to what I’ve read, if you plant a potato in a container that you can add soil or straw around the plant as it grows taller, it might produce a bucket of potatoes. I’m using store bought garden soil because that’s what I have on hand. I’m using a couple of old 5 gallon buckets that I used in years past as planters on the porch. They have holes in the bottom for drainage. I put about 5 inches of garden soil in the bottom. I cut the part that sprouted off the potatoes. I then placed the potato pieces in the soil. I covered them with about an inch of soil. I gave each bucket about 4 cups of water. I’ll post an update if a potato plant starts growing. Have you ever grew potatoes by a method like this? If so, did the potatoes grow and produce very well? This entry was posted in Garden & Yard and tagged buckets, gardening, potato plants, potatoes, soil, yellow potatoes. Bookmark the permalink. I hope you’re right. I’d love to grow at least a few. I’m not familiar with growing them in a sack. I think I’ll look that up. It sounds interesting. It’s much like a bucket, but more porous. I think I will try that again this year.. If it is ever warm enough to plant, I will! If I get it planted, I will. We are getting close to our no more frost date… yea! I would think they would grow….! It will be interesting to read your updates. I’m not familiar with growing potatoes in a bag. It sounds interesting. I have never grown potatoes at all. It’s one of those things I have wanted to grow but never seem to get to it for some reason. I might have to try this method, if you find it works well, since space for a garden is going to be very limited at my new home. I enjoy growing potatoes. If we hard a place to successfully store them, we’d probably still be growing them in the garden. I’ll be glad to keep you updated on their progress. Salpal1 and Whippetwisdom commented about growing potatoes in a sack. That may be something you might want to check on too. Yes, I will have to look into growing them in a sack! The remainder of this year will be focused on finishing the interrior work that needs done, then hopefully next year I can focus on outside stuff and get a little garden put in. I’ll need to build a little postage stamp garden. I’m looking forward to it! I have grown them before in a traditional garden and have had to battle potato beetles the whole season. 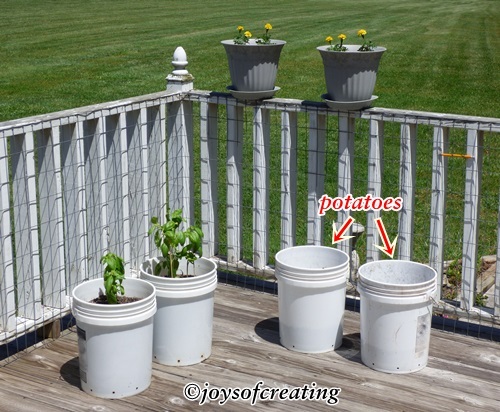 Are you going to have the buckets outside at all to get sun once the plant/flowers come out? I know what you mean. When we grew potatoes in the garden, fighting potato bugs was a constant battle. It’s one of the reasons that we don’t grow them anymore. I keep the potato planters on the back porch. I don’t plan on keeping them in my house. My husband likes the idea of growing a bucket of potatoes! I always grow 5 to 10 hills in the garden. I dig my planting holes at least a foot deep. Planted that deep, I never have to hill them! I like your method of planting potatoes, it takes a lot of the extra work out of gardening by not having to make those hills.